When I was growing up my Mom made Little Cheddar Meatloaves for us all the time and we loved them as kids. When I was raising our kids our income was small and my grocery budget was quite meager. I learned to feed our family of 5 for anywhere from $5 – $7 per meal. Hamburger became a big staple in our home because it was really inexpensive and I could stretch it. I could typically feed our family with one pound of hamburger for a number of years. One of the family favorites was my Mom’s Mini Cheddar Loaves, as we called them, or mini meatloaves. Now that my children are grown both of my daughters make these as well, so the traditiona continues. I also found this picture online of a fun way to make them for kids. The Grandkids love them because we then let them eat their broccoli and carrots with their fingers and they think it’s so fun to eat “broccoli hands and feet, and carrot legs, and mashed potato tummies. Here’s my recipe for Little Cheedar Meatloaves, I hope you enjoy them as much as we all do. Combine hamburger, oats, salt, cheese, onion, egg, and milk. Shape into 6 small oval loaves. In a small bowl combine brown sugar, mustard, and ketchup and spread over tops of loaves. 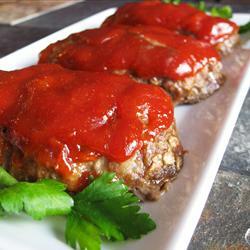 For the kids meatloaf bodies, shape meat into 8-10 small round meatloaves and bake without sauce for 35 minutes. 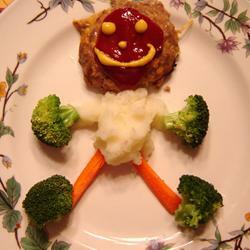 Top with ketchup and draw the eyes, nose and mouth with mustard when assembling on plate, along with cooked mashed potatoes, baby carrots, and broccoli tops. You can find many more recipes at our Bed and Breakfast Recipes page. This recipe, along with 349 others, can be found in our Cookbook Rocky Mountain Lodge & Cabins’ Favorite Recipes. You can purchase your copy at our Gift Shop. This entry was posted in Uncategorized and tagged Dinner Recipes by Debbie Reynolds. Bookmark the permalink.